Growth Habit: Tasmania has two species of thistle commonly called Slender Thistle, Carduus tenuiflorus and Carduus pycnocephalus. Both species are widespread and generally occur together. Both are major weeds of pasture, crops, roadsides and neglected areas. Seeds generally germinate in autumn, depending upon moisture levels, however germination at low levels may occur at other times of the year. The young plant develops into a rosette, usually up to 500mm in diameter, but plants are capable of growing much wider under ideal conditions. The upright flower stem is produced in late winter to late spring. This usually reaches up to 1 metre but may grow considerably larger. Type of Plant: Usually annual, but sometimes biennial. Flowers: Flowers are borne in clusters at the top of the flowering stem. Colours range from pink through to purple and mauve, and are approximately 20mm long and 12-15mm wide. Each “flower” is composed of many individual florets, each of which may produce a fertile seed. 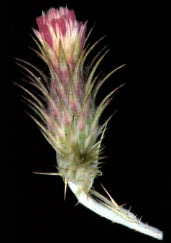 A single slender thistle plant may produce several hundred seeds. Fruit/Seed: Two types of seeds are produced, typical of many members of the daisy (Asteraceae) family. All seeds are approximately 4 to 5mm long, quite thin and protected by a hard coat. Seed colours range from yellow to light to dark brown. Dispersal: Slender thistles are spread entirely by seed. The seeds are equipped with a small pappas, or parachute of hairs, however they are not usually disbursed over long distances by wind. Most seed falls within a few metres of the parent. For this reason most slender thistles occur in distinct patches year after year and seldom spread evenly over large acreages. Livestock, particularly sheep, also spread seed in their wool. The seed is capable of remaining dormant in the soil for many years. Status: Both Carduus tenuiflorus and Carduus pycnocephalus are declared as Secondary Weeds under the Noxious Weeds Act 1964. At their peak in late spring time, slender thistles are one of Tasmania’s most troublesome weeds. They compete strongly with pasture and restrict grazing around them due to the presence of sharp spines. Dense infestations may greatly reduce the carrying capacity of otherwise productive land. Competition with crops may greatly reduce the harvest. Any removal of slender thistles must be followed up by establishment of competition to prevent thistles from reinfesting. Bare areas left in pasture after thistle removal should be oversown with competitive grass seed. All control methods employed should aim to attack the thistles in autumn or early winter before plants become established and are therefore much more likely to resist control efforts. Small patches of slender thistle can be chipped with a hoe, provided the taproot is severed well below the soil surface. Slashing or mowing may reduce seed set, but is ineffective at killing slender thistles. Grazing with sheep or cattle will not usually kill slender thistles, however quick grazing with high stocking rates of sheep in autumn just after thistles have germinated will greatly reduce seedling numbers. Grazing must be managed carefully however as overgrazing may weaken the pasture, allowing the thistles to colonise bare areas and successfully compete with the weakened grass. Goats can be used effectively to eat slender thistles, however unless their grazing is regular, plants may survive. Several herbicides are registered for use on slender thistles in Tasmania for both spot and boom spraying including glyphosate, clopyralid, 2,4-D, MCPA, metsulfuron methyl and dicamba. Any herbicide spraying should be targeted at the young plants in autumn and winter, as the thistles become quite tough and resistant to most herbicides as they commence flowering.